India will not lower its guard along the Line of Actual Control with China, while maintaining border peace in sync with the “Wuhan” spirit, Defence Minister Nirmala Sitharaman has said. Nearly a month after talks with her Chinese counterpart Wei Fenghe, Sitharaman said both sides recognised that the broad decisions arrived at the informal summit between Prime Minister Narendra Modi and Chinese President Xi Jinping in Wuhan should govern management of the border. “Absolutely”, she said when asked whether India is still on guard and not lowering it despite the Wuhan sprit. At the Wuhan summit in April, Modi and Xi resolved to open a new chapter in ties, and directed their militaries to boost coordination along the nearly 3,500 km Sino-India border, months after the most serious military faceoff in decades between the two nuclear-armed neighbours in Doklam triggered fears of an war. At the same time, she added that as defence minister of the country she was conscious of the fact that the she will have to keep the border guards alert. “Then I would also be, as Raksha Mantri, I would also be conscious that I have to keep (them) alert... Wuhan spirit, yes,” she said during an interaction. “I will also have to be conscious of my sea. It is less talked about,” she said. Last month, Sitharaman and Wei held extensive talks during which they decided to work towards firming up a new bilateral pact on defence cooperation and agreed to increase interactions between their militaries at various levels to avoid Doklam-like standoffs. “It is this (Wuhan) spirit, which both the Chinese and we recognise, will have to govern our borders. The Chinese minister referred to the Wuhan spirit more than twice and said we expect the sprit to be governing everything which happens to the last company which comes to the border,” Sitharaman said. The defence minister also referred to Modi’s speech at Shangri-La Dialogue in Singapore in June, saying his views about the region was even welcomed by China. In his address at the premier defence and strategic affairs conference, Modi said Asia and the world will have a better future when India and China work together with trust and confidence while being sensitive to each other’s interests. Talking about the Line of Actual Control, Sitharaman said as it is not completely demarcated, there are differing perceptions about it by both sides. 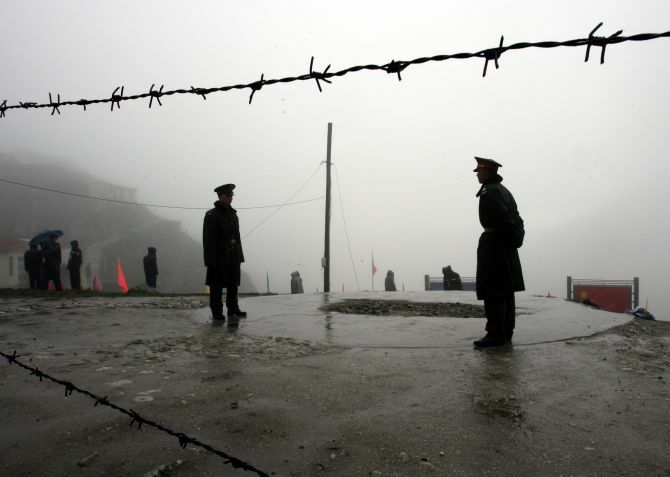 “There are several areas where the border is not completely defined and demarcated. As a result, the perception of where the border is one thing for us and completely differnt for them. So they come to a point where we think they should not be coming and we go to a point where they think we should not be going. So periodically this becomes cause for the flare up,” she said. When asked about the army officers, who have approached the Supreme Court to present their views on cases relating to the Armed Forces Special Powers Act, she said she has no “grudge” against them. The defence minister said the officers have chosen to go to the court as there is a “certain sense of worry” in their minds which she can understand. In an unusual move, around 700 army officers and soldiers have approached the Supreme Court, requesting it to protect the bonafide action of soldiers under AFSPA, and voicing concerns over reported move to dilute some provisions of the law which protects the security forces from prosecution without the Centre's approval. “Grievance redressal is a right. I will never want to say if you have a grievance, you should not voice it. I will never say that,” she said when asked about the issue. “There are institutional mechanisms available for grievance redressal within the army, navy and air force. So it is possible for men or officers to have grievance redressal institutionalised within the forces. “But if in the case of AFSPA, they have chosen to go to the court, there is a certain sense of worry in the minds of men and officers and I can understand that,” she said. “Now, if that is, from the point of view of human rights, taken to the court and the court is giving a full hearing and justice to hear everybody out, and if the officers and men felt they also would want to give their argument, I cannot grudge that. The Supreme Court has been hearing cases relating to alleged extra-judicial killings in Manipur by the security forces. Army Chief General Bipin Rawat disapproved of the move by the serving officers and soldiers to approach the top court in their personal capacity. At the same time, he had said the armed forces and the defence ministry are steadfastly behind all officers who have conducted operations in Jammu and Kashmir and the north east.